After an offhand racist remark from one of her classmates, high-school senior Asha Jamison decides to start a school club for mixed race students. She is part Indian, part Mexican and part Irish and tired of feeling pulled in multiple directions. I was surprised when school administrators blocked her efforts to create a multi-cultural club at school. They already sponsor an Asian-American club, and several other clubs to support specific ethnic groups. I was mystified that they'd choose not to support her club. Asha initially starts the underground Latte Rebellion on a lark, just to have yet another thing to add to her already impressive college applications. She and her friends figure they'll sell a few t-shirts, use the money for a vacation and that's about it, really. She soon finds herself spending more and more time on her personal project, however, organizing rallies, giving speeches (while in disguise), and watching in astonishment as her efforts blossom on-line into a national movement. She channels all of her stress about the highly competitive college applications she has coming up into the Latte Rebellion, forsaking her demanding homework schedule and endangering her GPA. Most tellingly, she forgets to dot the i's and cross the t's on her college applications. She fails to apply to a safety school. What I found most fascinating was that after all the hard work she's put into it, ostensibly to impress college officials, she doesn't even mention the Latte Rebellion on her applications. When her college letters come back with rejection after rejection, and she's wait-listed at one college, she's in a near-panic, having no idea how to admit her failure to her parents. In desperation, she asks a friend's advice -- he explains that she can write a letter of appeal, or possibly go to junior college, get her grades back on track and try again. So, after writing a letter to the college explaining her involvement with the now-famous Latte Rebellion, some travel, and an internship, she's able to start college a semester late and get back into the groove of things. This for me, was probably the most powerful message of the book. Not getting into your top-choice college isn't the end of the world. Life will go on. You can do other things. Asha tries to be a rabble rouser, but in the end, she's no Frankie Landau-Banks. She pulls together some t-shirt sales, and a few rallies, but nothing as creative or daring as I thought she would. Still, I hope that all teens, whether they come from a single heritage, or contain a mixture that would confound any Census worker, will pick up and enjoy this book about a girl trying to find her place in the world. 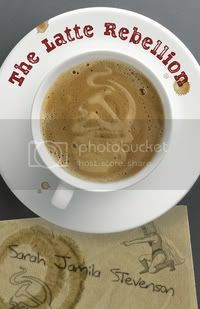 Check out the accompanying website: http://www.latte-rebellion.com/, where you can buy the t-shirt for real. very interesting book. I looks like it sends a very powerful message. Have you read it? I enjoyed it, although, as I mentioned, I didn't think it was as awesome as The Disreputable History of Frankie Landau-Banks. The school-angle was much heavier than I thought it would be. For all that it is supposed to be a book about race, I felt like that took a backseat to the main story, about the pressure this girl feels academically. Although, there is one scene which really struck me, where she is talking to her grandmother, who is telling her to be proud of her side of the family... and Asha feels sort of angry that her own grandmother is rooting for her to count one side first, instead of honoring all parts of her background. That was a really powerful moment. I wish the book had more moments like that.